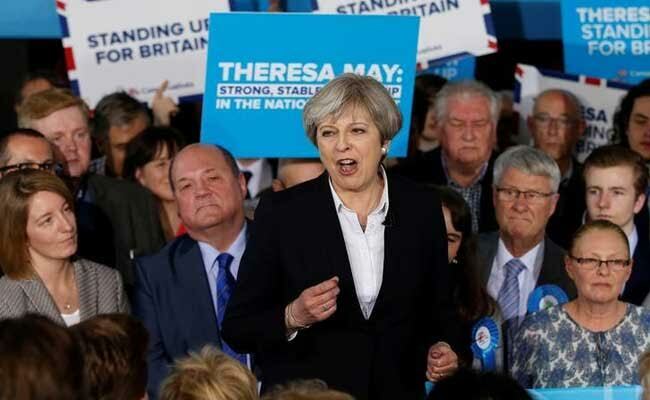 London: Prime Minister Theresa May warned British voters on Tuesday the European Union was lining up to win a divorce deal that "works for them", using criticism she had "illusions" over the talks to bolster her election campaign. After being criticised for underestimating the complexity of the Brexit talks with the EU at a meeting in London last week, May said the only way to secure a good deal for Britain was for the country to unite behind her at a June 8 election. "We need that strong and stable leadership more than ever before," she wrote in the local Western Morning News newspaper before campaigning in southwestern England ahead of an election which is expected to see her Conservative Party increase its majority in parliament by more than 100 more seats. "The negotiations ahead will be tough. Across the table from us sit 27 European member states who are united in their determination to do a deal that works for them. We need that same unity of purpose here at home to ensure we can get a deal that works in Britain's national interest too." After meeting May at her Downing Street residence on Wednesday, European Commission President Jean-Claude Juncker was reported to have said he was "10 times more sceptical than I was before" about the possibility of sealing a deal. May dismissed the report as "Brussels gossip" and her interior minister, Amber Rudd, told BBC radio on Tuesday that Britain would negotiate "more discreetly" with the EU and would avoid the leaking of details of meetings. The prime minister, appointed shortly after Britain voted to leave the EU last year, has stuck to her policy of revealing little about her negotiating hand before the talks start - most likely after the election. She has been criticised by opposition lawmakers of being "highhanded" in the run up to the talks, potentially poisoning the atmosphere as battle lines are drawn. The EU cannot hand Britain too much in the negotiations, fearful Brexit could encourage other members to bolt for the door, while May's political legacy rides on the success or failure of the talks. With her party still commanding a large lead in the polls despite some gains by the main opposition Labour Party, May again warned voters that any vote for other parties would lead to a "coalition of chaos" that could hurt the EU talks. "Every vote for me and my local team in this election will be a vote to demonstrate that unity of purpose, to strengthen my negotiating position, and to help me secure the best possible deal," she wrote in the newspaper. "The opposition parties are lining up to prop up (Labour leader) Jeremy Corbyn and disrupt our Brexit negotiations - a recipe for years of drift and division at this crucial time."